First, a bit of business. You may have noticed from the emphasis on love and passion in my post on porridge that I am feeling the love this February. This being so, I am going to devote my posts this month to those foods and meals that play a role in my love of life, and also, indeed, my love life. Now ya’ll know by now that I love soup. It just seems to be something that my body craves during these cold, wet, and occasionally snowy, months. This is never more true than when I am also suffering from cold, another common feature of February. As this is currently the case (woe is me), I thought I would share my fool proof recovery meal: homemade tomato soup with a fish-less finger sandwich. It’s a miracle worker. Now I have nothing against a good ol’ tin of soup. I have one almost every day. However, there really is something to be said for doing it yourself. Actually seeing the kilogram of tomatoes going into the mix makes you fully aware of the goodness you are going to take in; that knowledge alone makes you feel better. 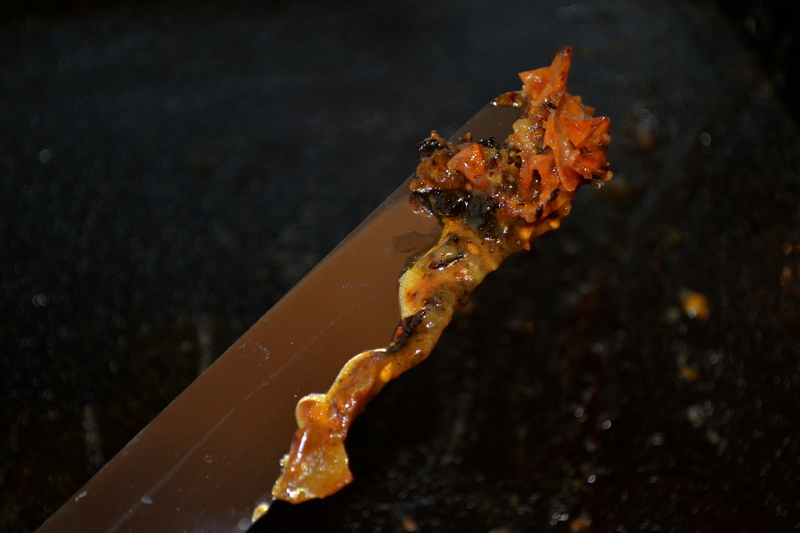 It may not be pretty, but the charred bits and juices are the most important bit! 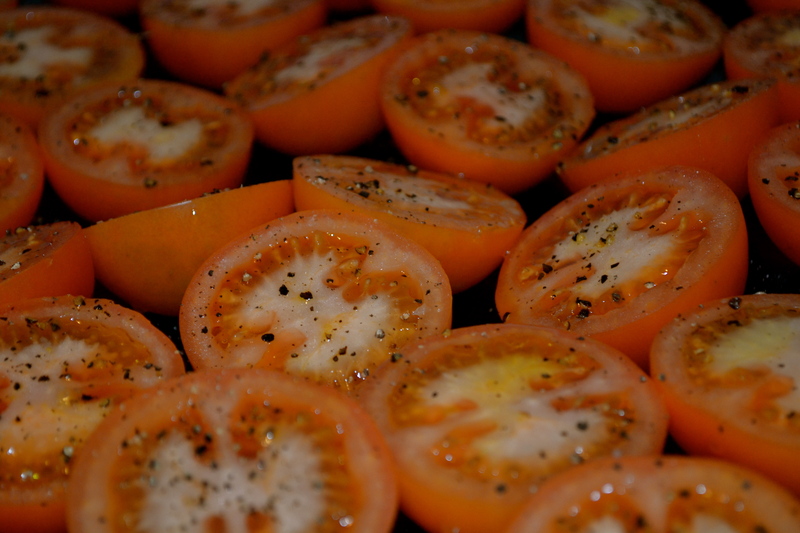 Cut the tomatoes in half (if you do it horizontally it means they will sit better on the tray). Arrange them, cut-side up, in a baking dish or tray, drizzle with oil and season with salt, pepper and a pinch of sugar. 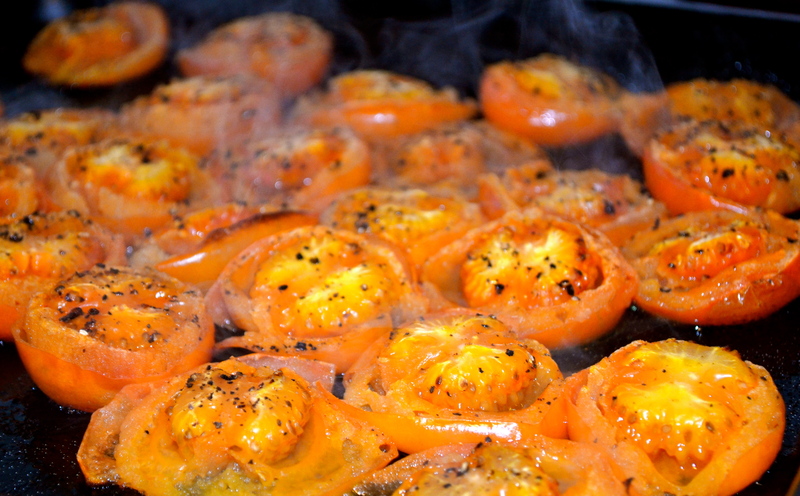 Bake these for about an hour, until the tomatoes are soft and starting to char around the edges. 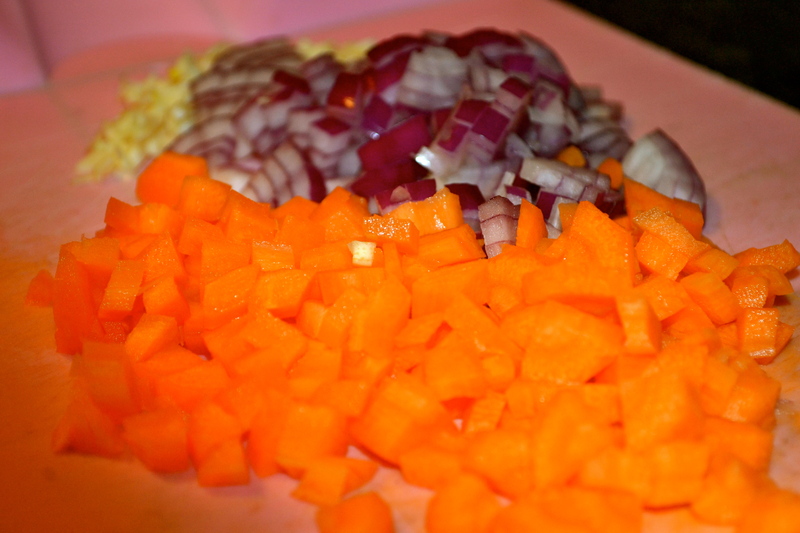 Heat a bit more oil in a large pan over a medium heat and add the chopped onion, carrot and garlic. Cook, stirring often, until softened. Meanwhile, chop the basil stalks, and then add to the pan and cook for another minute. Remove the tomatoes from the oven, and add them, plus any juices from the dish (which is the really important bit in getting the deep tomato flavour), to the pan. Add the stock. Stir and bring to the boil, turn the heat down, cover and leave to simmer until all the vegetables are soft, which should take about 20-25 minutes. Once the soup has cooled slightly, use a stick blender (or whatever you have) to purée the soup to whatever consistency you like. 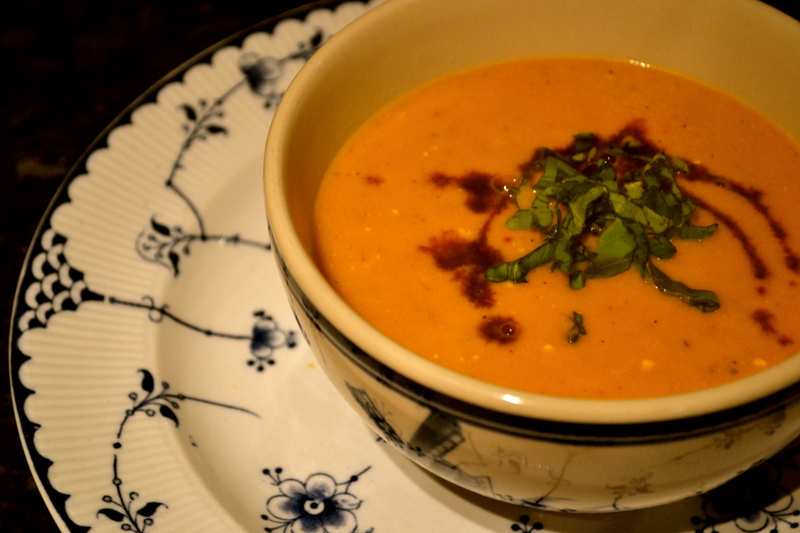 Stir the vinegar and creme fraiche through the soup, and season to taste. Reheat gently, while you tear the basil leaves into pieces, then serve with these and a drizzle of balsamic vinegar on top. As for accompaniments, some buttered bread may do. 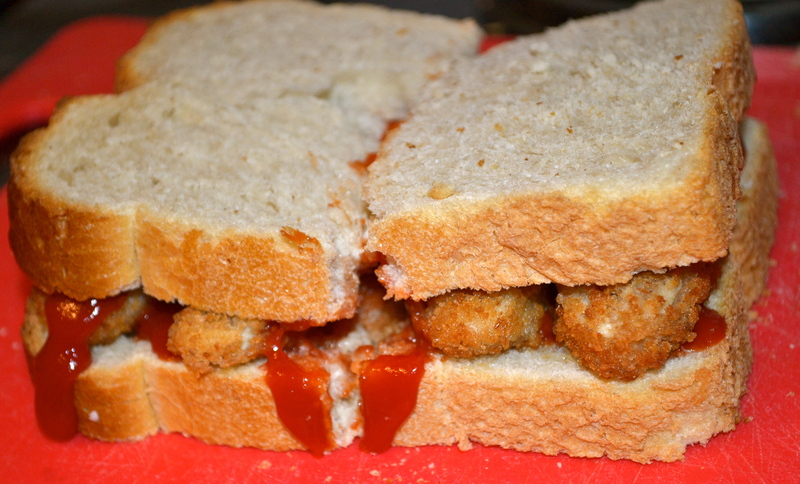 However, to have full effect on me I need some fish-less fingers, housed between two buttery slices of homemade white bread, with lashings of tomato ketchup. So wrong and yet so right. So wrong and yet so right! Don’t I spoil you? Just a little while ago I gave you the cure for a hangover, and now you have the cure for a cold. No need to thank me though. These little things just help keep the love, even when things are a little less than rosy. What cold cure do you swear by? And what soups do you really love?